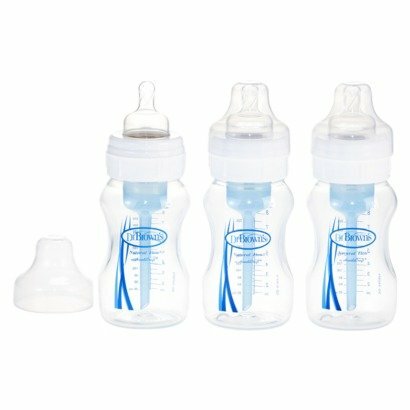 My All-Time Favorite Baby Products - it's BABY time! In my 3+ years of parenting I have tried quite a few different baby products; some I love while others, not so much. I received much of the stuff I wanted for my baby shower with my first born and came to find that some of them weren’t really as great or even necessary as I thought. Many new moms buy into things they think they absolutely need for their first baby, but the reality is there is a lot of money wasted on unnecessary purchases. We had planned on having more than one child so when we went baby-shopping I looked for items of value that I knew would last. After our second child was born there were still a few new items we ended up having to get. In my personal experience and from advice of other mommy friends I was able to make informed buying decisions about the products I have tried. 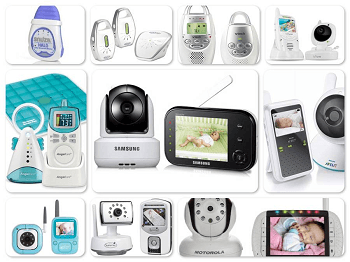 I have compiled a list based on this of the best products any parent should have on their baby shower registry as well as my favorites which I have separated into different categories. This was one of my favorite items. I loved it so much I gave one to my best friend when she had her baby. There was never an odor in the nursery. Only when it was nearly full, the pail would start to smell whenever you opened it to toss in another diaper. I would also suggest only using the Diaper Genie brand refills also. We tried bargain brands that were made for Diaper Genie systems but they didn’t last as long. I had received two infant bath tubs as gifts when I had my daughter. I loved this one more than my first choice that I had on my registry. It has a newborn hammock which we used for a while with our first because she was so tiny. It’s perfect for bathing newborns (once the umbilical cord falls off) because it keeps them from sliding and going all over the place. 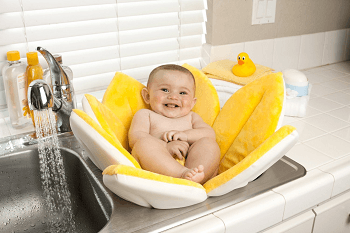 It’s a great value because the two different molded sides lets you use it when baby is big enough without the hammock and upright for toddlers up to 2 years. A neat feature is the color-changing drain plug to let you know when the water is just right. 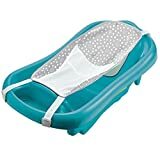 Another reason I preferred this tub over the other one is because of the soft foam pads inside that provide a more comfortable, less-slippery surface for your baby to lie/sit on. Before you leave the hospital you are going to need a car seat to bring your baby home in. The Graco SnugRide is the top rated choice for the safest infant car seat on the market. *Always check the latest car seat recalls to ensure your child’s safety. We will never recommend products that are currently on recall; however a product we’ve mentioned may become recalled after the time the article was written. 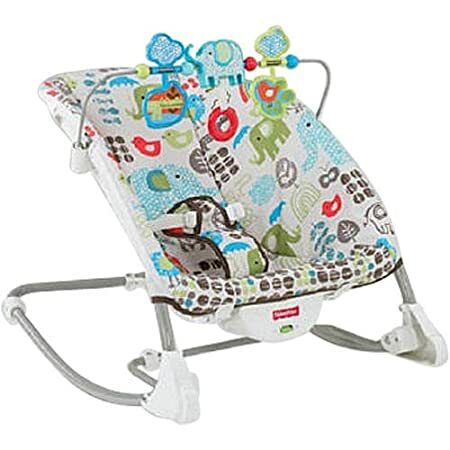 Always register your car seats as well as other infant gear after purchasing to get updates from the manufacturer should your product become recalled. Both of my kids loved this item. Unlike traditional mobiles that you have to wind and only last a couple minutes, the sounds on this mobile last for 20 minutes. There are 3 options for sounds: a heart beat which newborns are used to, music, and nature sounds. It has a mobile of plush animals to amuse younger babies, and then can be removed to project on the ceiling. Newborns like to be close to mom. My son constantly wanted to be attached to momma, but I just couldn’t hold him all the time. Moby is one of the best wrap carriers out there. It’s better than a sling because the wide fabric covers both shoulders in order to distribute weight more evenly. I have tried several different types of bouncers and this one was my favorite. This bouncer gives you the best bang for your buck because it grows with your child into toddlerhood as a rocker. The kick stand comes out to put it in a stationary position that is more reclined which is perfect for newborns and sleeping. You can turn the vibrations on to calm baby in addition to rocking them in it. The toy bar is removable for convenience. It’s light-weight enough to be picked up and move from room to room. This was a must-have for us because when we had our first child our living space was smaller. 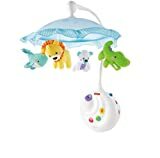 You have a bassinet which you can use for naps or bedtime when they’re little with a cute little mobile for entertainment. The changer was great to have for day-time diaper changes (and useful for sponge baths before her umbilical cord fell off – the compartments were perfect for having everything I needed within arms reach) We also used it a couple of times on trips which was easy to fold up and transport. When baby gets older the bassinet is removable and you have a safe place for them to play. An infant carrier was a life-saver for my second child. Wraps are good when baby is tiny, but these are good too when your baby gets bigger. The breathable mesh material makes it comfortable for baby during the summer. The design gives you free range of motion so you can get things done around the house while keeping baby close by. It’s also great when you want to go for a walk or shopping in a really crowded area where a stroller is more of a hassle than convenience. It’s great for dads too. Infant car seats are great because you can just pick them up and bring baby with you in it without disturbing them, but at some point most babies get too long for it before their 1st birthday. The AAP (American Academy of Pediatrics) advises keeping baby rear-facing until at least the age of 2, so we sought a convertible car seat when our kids outgrew their infant car seats. Our first thought when we saw this product was that it looked stupid; however that was before our baby grew out of the swaddling stage and kicked the blankets off during the winter. By 4 months both of our kids would not stay swaddled and this was our only solution for keeping them warm on cold nights. They have a quilted option for regular nights and micro-fleece for when it’s colder. 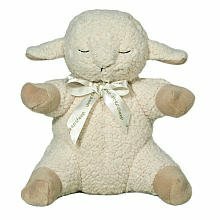 On top of being adorable, this sleep machine has 4 soothing sounds to help lull baby to sleep. 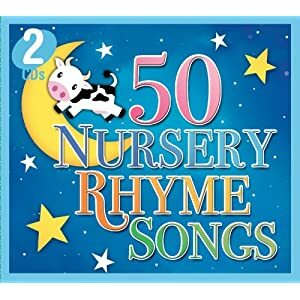 Babies are used to the sounds and noises they hear when in-utero so most find it comforting to have some type of background noise to sleep to. You can put it near the crib as part of his night time routine or take it along when you are traveling. There’s also a Velcro strap which you can attach it to any car seat or stroller. While some parents can swaddle a baby with a plain old receiving blanket, I found it to be quite tricky most of the time. 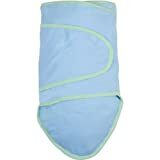 For those who are swaddle-challenged, this swaddling blanket is a great solution. It has internal flaps that hold baby’s arms down so your little Houdini can’t wiggle out of it like with other brands of swaddling blankets. Not exactly a necessity but for a fussy, colicky baby like our son was, the swing was a dream. The design cradles your baby for a secure feeling like being held in mother’s arms. The one we have is actually brown and green (neutral) but I love this swing because of all the features. It has 10 songs, 5 nature sounds, 4 one-hand reclining positions, and automatic shut-off. The tray lifts up for convenience when taking baby out. I went with the full-sized swing as opposed to a smaller travel option because the bouncer which rocked (basically the same concept as a swing) was portable if we were going somewhere. It holds infants 6-30 lbs. his is a great activity gym for little ones. It has a mobile that plays mostly classical music for 8 minutes to entertain baby during the early stages. You can add extra toys for your baby to play with as they get older. For tummy time just remove the toy bars and let baby explore on the soft, textural panda mat. 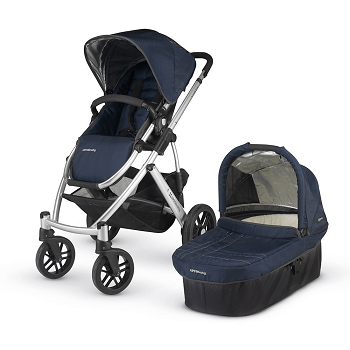 This stroller is jam-packed with features you will love. 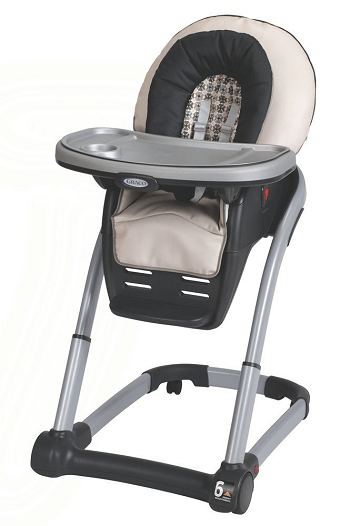 It is adjustable for tall parents and folds up compactly for easy transportation. It is adaptable for an infant car seat and holds up to 45lbs. It comes with a cup holder, a basket underneath to hold your diaper bag and other accessories, and includes the rain cover. You are going to need a diaper bag to hold all of baby’s essentials when going out. Trust me on this – don’t skimp on a cheap diaper bag. 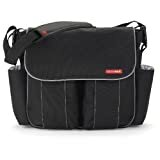 Diaper bags go through a lot and this one is really durable. The poly-canvas is easy to clean and water-resistant. This bag features 11 pockets to organize your essentials so you aren’t digging around a huge bag of stuff for a pacifier! It even has clips to hook onto the back of a stroller. 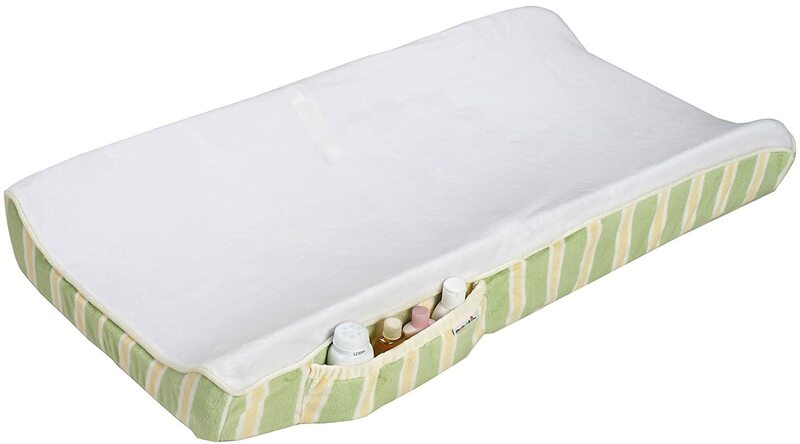 Whether or not you have a changing table, this changing pad can turn virtually any flat surface into a changing station. It has a non-skid bottom so you can also use it on top of a dresser. You will likely need to have a changing cover for your changing pad (preferably more than one because surprises do happen) I liked this one not only because it was super soft and stylish, but because of the handy pocket on the side. It was perfect for keeping a small container of powder and baby lotion right at hand.